Western Canada has the Sutters, Northern Ontario has the Staals, and now the Strome’s are turning into THE Southern Ontario Hockey family. Ryan has been grinding out a decent career with the Islanders, while Dylan is breaking records in the OHL and on the verge of starting a very long and productive NHL career, and then there’s Matthew. 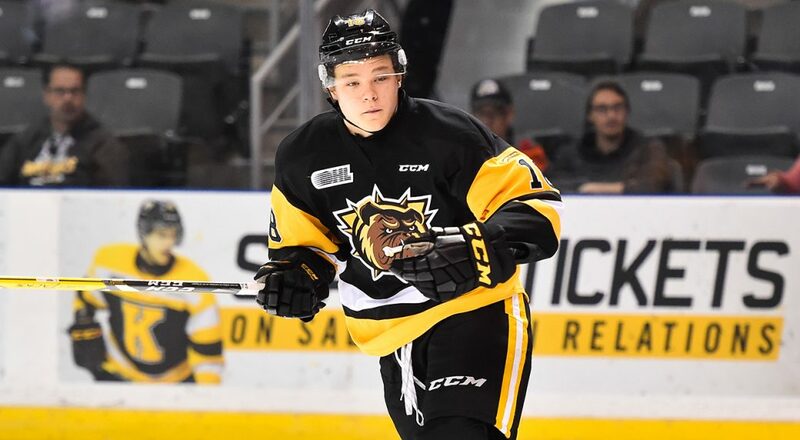 The ‘little brother’ in age alone, Matthew is a big power forward playing for the Hamilton Bulldogs that is hoping to hear his name called in the first-round of this year’s NHL Entry Draft. Now let’s get this out of the way early – Matthew is not as good as Dylan. He is a much different player that shouldn’t be looked at as a blue-chipper like the middle brother. Matthew plays a different game, and likely wouldn’t want you to compare him to his brothers – so don’t do it. At 6’3, 205lbs, Matthew is a big kid and his game reflects that. He battles hard for puck possession and is relentless down low at both ends of the ice. He has a hard-nosed game and uses his size to establish his presence around the net. As a result of being so good at using his size, he’s a useful commodity on both the penalty kill and powerplay. With that said, he’s not just a bruising big-bodied winger, Matthew Strome has a lot of finesse to his game that you don’t usually see from players his size. Strome has good hands, an accurate shot, and very high-end hockey sense. He uses his size to win battles and gain possession, but then his puck skills to make something out of it. He’s got very good vision and an all-around offensive game that allows him to be both a facilitator and finisher. So what’s stopping Matthew from being a top-10 pick like his brother? “I just don’t know at this point,” one Ontario-based NHL scout says. “if he’s a prospect at the next level for me or just a really good junior whose skating keeps him out of the league. “His brother [Dylan] wasn’t a great skater in his draft year, but you had a sense that it was just a matter of strength—if he put the work in, then it was going to improve, which is exactly what happened in the season after his draft year, a big step up. From the time he entered the OHL, Strome’s biggest weakness has been his skating. He’s got one of the bigger bodies of any draft eligible forward, and he skates like it. Scouts were hoping to see a big improvement in his second season with Hamilton – and while he did improve, it wasn’t nearly enough to show the kind of progress NHL teams would want. Despite his inability to move around the ice like a top-end prospect, Strome has the ability to put himself in a position to capitalize on scoring chances thanks to a very high hockey IQ. He had 34 goals this season, 24 of which came at 5v5 – placing him in the top-5 among draft eligible OHL forwards in both categories. He’s a big-bodied presence in front of the net and has the hands to finish off plays down low. That said, he can do a lot more than just finish plays around the net. Strome also has the ability to create scoring chances on his own when given the time and space – the problem is that he doesn’t have the speed to create that space for himself. He’ll still get drafted in the first round, but whichever team selects Matthew Strome is going to do so knowing they need to be very patient with his development. The temptation will be there to rush him to professional hockey since he already looks like and NHLer in terms of size – but another two years in junior is what he needs. Whichever team he ends up with, Matthew Strome is certainly going to spend a large chunk of his summer working with skating development coaches. If he puts in the work and improves enough to be even an average skater, Strome will end up being a very good NHL player. The ceiling for the youngest Strome bother is that of a top-15 draft pick, while the risk of failure is likely higher than most first rounders. He is a boom or bust prospect, but if he puts in the work and improves enough to be even an average skater, Strome will end up being a very good NHL player.